If you watched the Super Bowl you know it was pretty boring. But for Atlanta the Super Bowl was pure energy and excitement. It went off without a hitch, showcasing our capital city as a major destination for professional sports. More than 70,000 fans from across the country stayed in our hotels, ate in our restaurants, and visited our tourist hot spots. And 100 million more people watched from home. Next up for Atlanta: winning the bid to host the 2026 FIFA World Cup. This event would outdo even the Super Bowl: By some estimates, over half the world watches the World Cup. Unless Georgia passes a License to Discriminate. 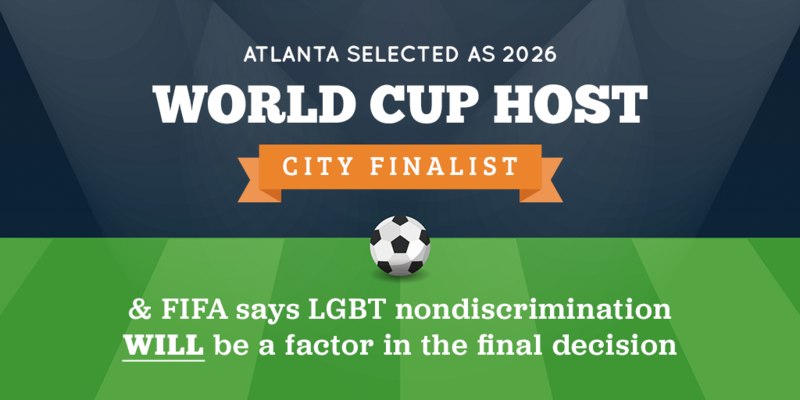 For the 2026 games, FIFA is taking “human rights risks” into consideration when selecting the 16 North American host cities—and that includes attacks on LGBTQ people. That’s right: Atlanta could actually lose this opportunity if lawmakers continue to introduce bills that, if passed, would sanction discrimination against LGBTQ people. FIFA’s new policy also explicitly states that it “strives to create a discrimination-free environment within its organisation and throughout all of its activities,” language that would seem to explicitly call out efforts to discriminate against LGBTQ people. Minky Worden, the director of global initiatives for Human Rights Watch—which spearheaded the drive for this rules change—says this could put Atlanta at a distinct disadvantage if anti-LGBTQ lawmakers continue their legislative push for discrimination. The state of Georgia’s risks on LGBT rights are considerable. Hardliners have moved laws to discriminate against LGBT people and families in the last five legislative sessions. … [and] Georgia is one of only five states that has no hate crimes law. Additionally, it would strengthen Georgia’s commitment to human rights — and Atlanta’s viability as a host city — if the state enacted protections based on sexual orientation and gender identity. Don’t sit back and watch extremist lawmakers imperil our economy and attack our LGBTQ neighbors for a fifth consecutive year. Tell them that religious exemptions legislation will hurt our chances at hosting the World Cup and hurt the reputation of our entire state.